Eagle Mountain Internet Service Providers | Your Internet Information Source! "Which Eagle Mountain Internet Service provider is right for you!" Innovative Air has proven over and over that they are the best company out here in Eagle Mountain. Their speeds are better than the wired providers, their latency is fantastic, and their support and service is next to perfect. They have limited coverage, but it’s growing every day. Just take our word for it! They will surprise you! 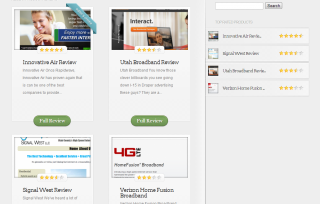 Utah Broadband is a great company to deal with. They are very friendly and courteous to their customers and believe in high standards. They don’t raise their rates, apply additional taxes or fees, or force you to bundle your TV and phone to get a good price. Switching to their service is painless and easy. It’s hard to ignore 50/50 speeds, but that comes at a price. Vivint, primarily a home security company, is now in the internet business. They have deployed their network in concentrated spots all throughout the Wasatch Front all the way up to Clearfield. It’s now in Eagle Mountain and we’re a little on the fence. Here’s why.